...since my Tatang passed. Just like my Nanay who 'left' 4 months ahead of him, I miss him so much. I was, am, and will always be his little girl. My throat hurts at this moment while typing because I'm trying not to cry as the little one is here beside me. So who is this man we fondly call 'Tatang'? He's a very hardworking man who spent his entire life trying to make a living to support everyone in his family, some siblings and his mother included. He never finished school because at the age of 16, he was already working full time to help augment his family's income. He got married a bit late [at 29] because of this "responsibility". He and my mother didn't start a family of their own right away because he wanted to help his family a little more I guess. We didn't have a lot of material things growing up but he made it a point to be there all the time. I remember not having a television set for the first 12 years of my life but we never cared about it because he would tell us stories or jokes during the time that some other kids with TVs were glued on their television sets. We grew up in a house full of laughter because of his funny stories to keep us entertained. My going to [and finishing] college was an accomplishment not only for me but for him as well because his dream of getting a degree would finally be realized through me. He spent the first 2 weeks of my college life teaching me how to commute to and from school. During my 4 years in college, he would visit me at my dorm twice a week, to give me allowance and to bring me clean clothes. He did that for 4 years without fail. He was with me when I applied for my first real teaching job. He was there when I did my demo teaching. And he was the one who brought me to my apartment when I moved in to start my life as a full time teacher. He would call me every week just to check if there's anything I needed and if I did, he would make the hours of commute just to bring it to me. When I taught overseas, he would call me just to hear my voice and know that I was doing ok...that's all he needed...to hear my voice. He would tell me that nothing made him happier than to see me everytime I would come home from anywhere I've been. He gave me a pair of RayBan sunglasses when I first started teaching. I wore them with pride every chance I got. One day I was on my way home to visit them. I was riding a jeepney from Sucat to Baclaran, somebody snatched the sunglasses off of my face. There was nothing I could do because the jeepney was in motion. All I did was cry all the way home. I met my father along the way and told him of what happened. I thought he would get mad. Instead he just hugged me and told me that it's something replaceable. That he's happy nothing happened to me. He sent me home feeling a little better. When he got home that night, he had a surprise for me: a new pair of RayBan sunglasses. I don't know where he got them as I knew they cost a 'fortune' with the little money he made with his job. But he didn't care of the cost...all he wanted to show me that yes, those pair of sunglasses were indeed replaceable. I can't help but to....tear up while reading your entry...I exactly know how you feel...because like you, I also don't have a father anymore... It's been 10 years, but I still miss him... He will always be alive in my heart! I know that your father, wherever he is now, is very happy and proud of what you are now. to be honest sis, i cried, i remembered my lola (i grew up with her). I can feel your pain sis. I feel lucky that I have both my parents alive. hey! That's not fair, I got here to read some wacky stuff! I cried okay. Just because the things you said is heartfelt. I just wish mine would be more stories like that. My father died when I was 2 years old. Well you know, I believe your parents are such a good one because they brought up a daughter like you. you're a good person and I'm sure thats what they wanted. i can't imagine losing any of my parents though we never became close to each other at home. reading this entry makes me wanna value my parents while they're still living on Earth.you just made me cry Miss J.I know how it felt missing someone close to your heart. Ang bait naman ng tatay mo.I admire him for all the sacrifices he had done for you.whoaaa ano ba to...bawal umiyak ngayong umaga kaya ciao muna ako. dropped my EC here kaya napadaan ako. anyway mommy, take rest...you don't have to worry because i am sure they are happy kung saan na sila ngayon. what you feel is normal. you would surely miss your great parents. and i say they have done a good job raising you. Why would you stop yourself from crying just because your little girl is there?Let it go!Kaya sumasakit lalamunan eh. I know that you're happy in anyway to have parents like them,I am too.You're father is a real father and I know that he's the happiest father when you graduated your teaching career.He was complete I know.tsk tsk...you made me miss my father!I did no good to my father,joke!He cried on my wedding day,on the day I left for my first job and on the day I flew here...and oh,he also cried over the phone because he missed me!I am the "inday" in the family. this is a very heart warming post. i cant help but got teary eyed. i can tellthat you were so close with both of your parents, jules. it must have been hard for you when they passed away. though theymight not be here, but the good memories will always linger. thanks for sharing this part of your life with us. Dear, you made me cry with the story you shared about your father, he is really indeed a good father, provider and supportive and loving father, you are lucky to have a father like him, am so sorry for your lost. Darling, he is so much like my Tatang. I tried not to cry but that was a heartfelt story. We both have a great Tatang that loved and cared for us and left us. I will say a special prayer for him. Just thinking Pota galang mikumpare lapa king langit kanyan. smile. How do i live with them???? that's the biggest questions that i'm asking myself, i am here living too faraway from my mama and papa and i dont know how much years would i be knowing they will still be here to hear their voices as often as i did when i was in pinas, i should not left nlng jud so i'll be there spending the days with them masking minsan lang diba? now, i'm too far and i can't be physically be with them, i've been praying nlng na sana God will give them more years para makita pud nila akong magiging anak..
now that would be the question that i'll be putting in my head, but hopefully and praying that it will be more years for both of us. what a heartwarming post. your Tatang was a great man. It's such a bad day for me tuks, my blogs are corrupted, I don't know if my host will be able to restore everything. The server was down when I got home and called them and they restored them back then I noticed the archives were not working on the lair so I called them again. it must have been something that the tech guy did that caused the files to be corrupted kasi biglang nadamay yung world. as it is they're working on the scripts. I hope ma-restore lahat. I can cry right now, imagine the opps I've written and worked on if they're not restored. di bale na the money but my efforts would all go to waste. mukhang ayaw ko na yata mag blog for money, nakaka-disappoint. eh, wala pa naman akong alam tech wise. ay napahaba litanya ko. I'm just sick to my stomach right now. I just hope ma-restore nila lahat. sobrang nakakaiyak naman yung story mo. miss ko tuloy si nanay ko, buti nalang isang tawag nalang ngayon. i can't wait to see her next. waaaaaa... nakakaiyak na man to. parents are ought to be valued talaga! such a touching story, sis. i know the feeling of missing a loved one 'cause my hubby is also up there now. but for sure, they're happy where they are now. OMG! my stagnant synopses just connected! my papa's death anniv is also july 18. he died in 2000 too! grabe!!!!!!! i kept on thinking july 19. kasi he was in the US when he died july 18 nga!!!!! pa-cheeseburger ka naman dyan!!! lol! aaawww...i have been crying quite a lot these days because of something else that happened...now with your story, i just had to cry again. there is so much love in your family. no wonder you are also very loving. whew! got a lump in my throat while reading that! you are indeed a very lucky girl having such a devoted father! you and your siblings may not have been able to experience material luxury early on, but the pure love and compassion of your parents were there that i know for sure have supported all of you as you battle with life later on. i do admire how you dad, sorry, tatang, took up time to always be there for you. i know he is so proud of what you have become today. deep inside i believe he passed on a very fulfilled man! i have to stop now, for i can't help but shed a tear! thanks for sharing! it brought tears and smile to my face! 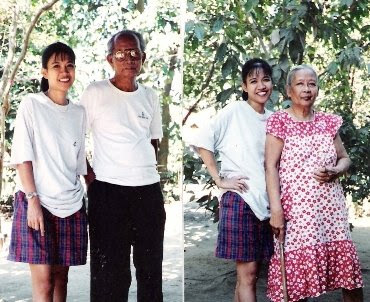 Your story of your Tatang brings back the memories of my father whom I call Ama. They had similar characters. Thoughtful, caring and very giving. Actually, your whole story is much like my very own story, 99%. We're so blessed, we had fathers like ours. let the tears flow! they are happy right now with the creator. Reading your post it tears me up........I grew up without my Mom and it was very hard. She passed away when I was 15 years old and left me no choice but to raised my 4 siblings. It was a struggled for me going to school, running the household and the children.... I had to help my Dad just to survive and trying really hard to have a life without my Mom. My Dad never remarried because he still living the memory of my Mom and we all still missed her terribly. Sometimes I cry to sleep these days but nothing I can do about it, all I have is her memories that I kept in my heart. I am Daddy’s girl too and I missed my Dad,and my siblings. I call them at least once a week and we keep sending txt msg a lot. i'm sure he is proud of you! lucky you that you have a responsible father...unlike me. Tatang's story is the same like my Dad. We are lucky to have them supportive and caring fathers. I'm Dad's little girl too, pero di brat. That's why I chersih the moments that I'm still with my parents. beautful heartwarming thoughts for someone being loved and really missed. don't worry, sis, you will meet them again soon in the resurrection morning and not just one day but forever. pls know you one of the lucky ones who got a very supportive and loving father. not all has one eh.